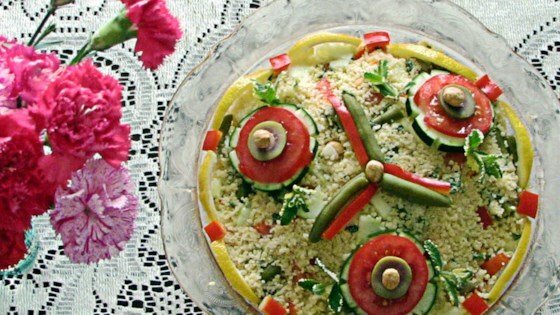 "This delicious salad will delight the whole family." Make a dressing by whisking together the lemon juice, 2 tablespoons olive oil, tahini paste, mint, asafoetida powder, and parsley; season with salt and pepper. Set aside. Combine the water with 1 teaspoon salt and 2 tablespoons olive oil in a saucepan; bring to a boil over medium heat. Remove from heat and stir the couscous into the water; cover for 10 minutes. Place the couscous in a large bowl. Mix the diced tomato, red bell pepper, green bell pepper, green beans, chickpeas, cucumber, olives, and peanuts into the couscous. While stirring, slowly pour the dressing into the mixture. Serve immediately. Made this at TWC got good reviews sold out people who dont usually eat in the cafe sought it out to buy! This salad is pretty good! I didn't really like the sound of the dressing, so I substituted it for the dressing found in "Pasta Salad with Homemade Dressing" by BONNIES.